CHECK WITH US BEFORE ORDERING THIS ITEM. OUR SUPPLIER HAS STOPPED MAKING THEM AND WE ARE LOOKING FOR ANOTHER MANUFACTURER. 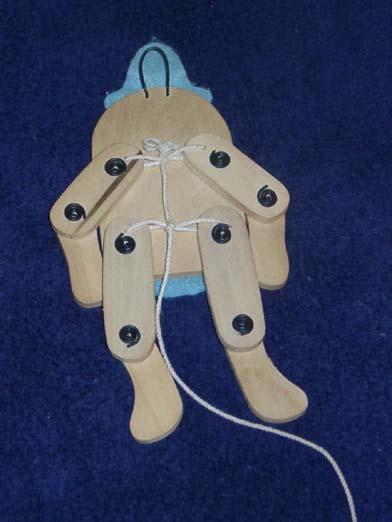 Although moderately simple, in order to get the entire toy jumping at one time requires a complex arrangement of the cords (see the picture of the back to the right). Jumping jacks became a fad in the middle of the 18th century but the have a lineage that goes back to ancient time periods. Even though they were a fad about a hundred years before the civil war period, a Harper's Weekly in 1860 shows them for sale in an illustration of a toy shop. Their use is very simple. 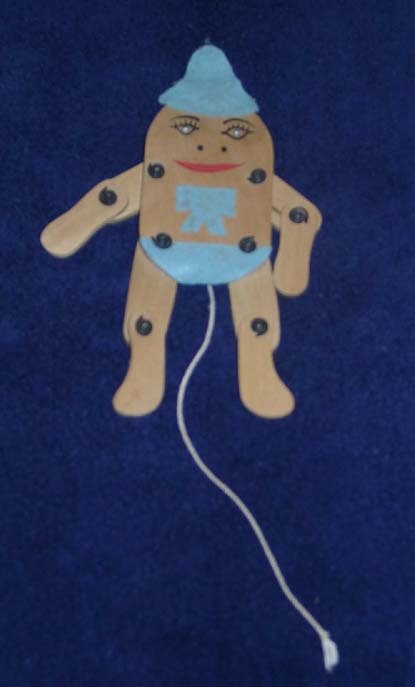 They are held or hung by the wire loop on the back (see picture of back) and the string is pulled down. This makes the toy jump as arms and legs both flail wildly. The cost of a Jumping Jack will be determined when we find another supplier.